As a lifetime science fiction watcher, I’ve been patiently waiting for current science to catch up to the futures I saw on the screen. Tiny computer in my pocket? Check. Hovercraft? All good. Commercial space flight? Almost there. 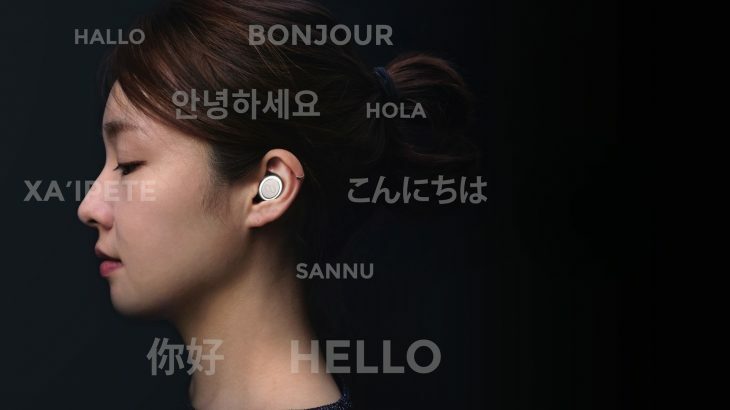 But when I saw the Indiegogo campaign for Mymanu CLIK – wireless earbud translators – I looked at them through my former public librarian’s eyes. My mediocre Spanish fluency would be replaced by effortless, instant, two-way translation, smoothing out frustrations and improving customer service. Imagine: A library staffer wearing an earpiece and holding a smartphone (translation app installed) asks the patron to speak into the microphone, then hears the translation in their earpiece in real time. The conversation goes quickly, and the patron is more likely to get the information they need, even if the materials are still mostly in English. Of course, there are concerns and questions. The key to most real-time translation is the computing power of servers hosted…somewhere…owned by…someone. As the person you’re listening to speaks, their words are streamed to these computers, analyzed, translated, and the translation is streamed back to you. Is that content saved, are people identifiable, what happens to patron privacy and library liability in the age of livestreamed translation? We collectively threw a fit when we discovered Adobe was sending patron information in the clear through their ebook reading service? Are we willing to ask for less in the name of better customer service? More immediately, how accurate are the translations? Google Translate is good, and getting better all the time, but if we’re using these services to help patrons find medical or legal information, we can’t risk misunderstandings. Again, is it worse to suffer along with no translation at all, and run the risk of inaccurate information, or to risk a bad translation? Both the CLIK and the Pilot earpiece from Waverly Labs are coming soon. What questions do we need to remember to ask before we’re mediating our interactions through these devices?